Home » Health » What Is Numulatory Dermatitis? Numularis Dermatitis or Nummular Dermatitis is a disease of the skin characterized by pain in the skin. This painful area of the skin is often coin or oval that appears after damage to the surface of the skin. For example due to burns, friction or insect bites. Spots that feel sore from Numularis Dermatitis can persist for 1 week to 1 Month. Nummular Dermatitis is also known by other terms, namely eczema numularis or discoid eczema. Numulatory dermatitis is more common in men than in women. Numulatory dermatitis in men often appears first at the age of 55-60 years. Whereas in women, this condition first appears at a younger age, namely when adolescents or adults. The size of the dermatitis varies from 2 cm to 10 cm. It often appears on the feet, but can also occur on the body, hands, arms and soles of the feet. Colors can vary from red, pink or brown. Itching and mild to severe burning. Itching often appears and gets worse at night, and can interfere with the quality of sleep sufferers. The skin that has dermatitis then secretes fluid that can turn hard and scaly. Metals, including rare and toxic metals (eg nickel and mercury). Drugs, such as neomycin or other antibiotics used in the skin. Very dry skin ( xerosis ) . Have or have a history of atopic dermatitis or stasis dermatitis. Poor blood flow and swelling in the legs. 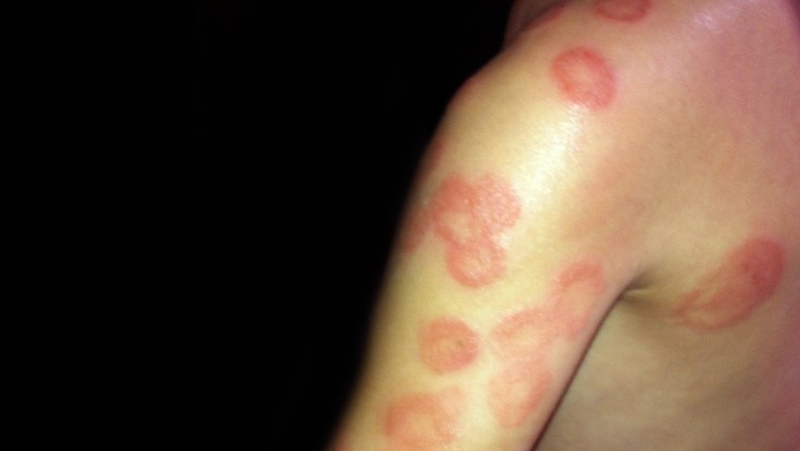 Injuries to the skin due to insect bites, chemical compounds or physical friction. Taking drugs that can increase skin problems, such as isotretinoin and interferon. Live in a dry or cold area. Irritants from the environment, such as soap, chemical compounds, etc. Swabbing and bacterial culture. Swabbing is done by taking exudate fluid that comes out from the part of the skin that has numularis dermatitis. This method aims to detect whether there is a bacterial infection in the area of ​​dermatitis. The bacteria that generally appear in the area of ​​dermatitis include Staphylococcus aureus , Helicobacter pylori , and Giardia spp. Especially if the patient has a history of infection with these pathogens. Skin biopsy. Skin biopsy is done by taking skin tissue in the part that is inflamed, then observed using a microscope. Skin biopsy can distinguish microscopic numularis dermatitis from other diseases, such as tinea corporis, psoriasis , and T-cell lymphoma. Avoid physical disorders of the skin from the outside, such as friction, incision, and slices. Avoid using clothes that can trigger allergic reactions, such as wool. Avoid skin from dangerous chemical compounds, such as floor cleaners, soap with a hard chemical content for the skin, clothing softener, and others. Avoid skin from being exposed to hot water. Use moist bandages in the area affected by dermatitis. Maintain skin moisture. After finishing bathing with warm water, wipe the skin moisturizer on the part that has inflammation. This method will help reduce itching and prevent scaly skin. Even so, you should first consult this method with a dermatologist. Corticosteroids. This medication can help relieve numulatory dermatitis by reducing inflammatory reactions. There are two ways to use corticosteroids to treat numulatory dermatitis, namely oral (swallowed) and topical (applied directly to the skin. Some examples of this type of drug are topical triamcinolone , prednisone, and clobetasol. Antihistamines . This drug is used to relieve allergic responses and also helps sufferers of numularis dermatitis to sleep better. Keep in mind that the use of antihistamines will cause drowsiness, including nonsedative antihistamines. An example of this type of drug is hydroxyzine. Antibiotics . This drug is used in patients with dermatitis that has been accompanied by a bacterial infection. Some types of antibiotics used for numularis dermatitis are sulfamethoxazole, trimethoprim , dicloxacillin, erythromycin, and cephalexin . 0 Response to "What Is Numulatory Dermatitis?"